During WWII, a wide variety of auxiliary ships were developed to allow the US Navy to turn a deserted island into a forward base for the fleet. In the closing months of the war, improved techniques for underway replenishment greatly reduced reliance on these bases, as ships could now stay in forward areas much longer. But while many of the auxiliary types that were in service then have died out, others have been developed to take their place, and play vital roles on the oceans today. Some types have survived more or less unchanged. The USN still has a pair of submarine tenders based in Guam to provide support to the undersea vessels of the 5th and 7th Fleets. Two hospital ships, Mercy and Comfort, were converted from oil tankers in the 80s and today serve primarily to project soft power by bringing medical aid to those in need. Each has a 1,000 bed hospital, 12 operating theaters, and a staff capable of performing any medical procedure short of organ transplantation. Fleet tugs still tow ships, as well as backing up the salvage ships in their mission of recovering objects from the sea bottom, supporting divers, and operating underwater vehicles. Perhaps the biggest factor in the development of new types of auxiliary ships has been the rise of electronics. One of the most prolific is the type generally known as the AGI, a ship stuffed with equipment designed to gather electronic intelligence. The Soviets deployed large numbers of these vessels, usually converted fishing trawlers, to shadow NATO warships, and make sure they had the latest electronic signatures in the event that the Cold War turned hot. These AGIs became infamous for getting in the way and generally making a nuisance of themselves. 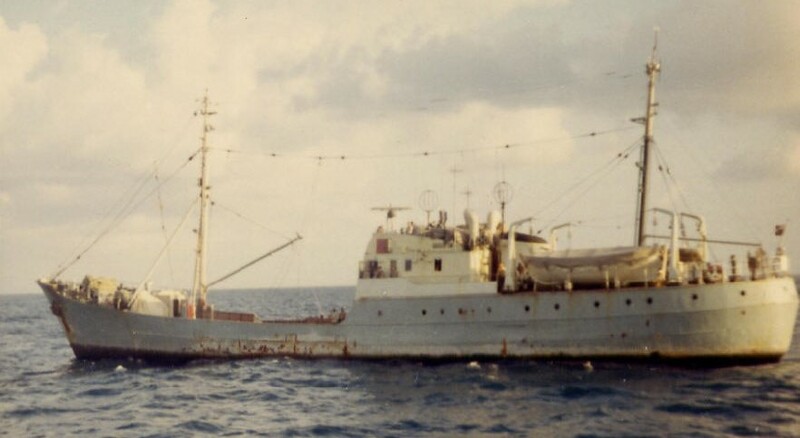 The US converted several freighters to a similar role, although these vessels were intended to function as mobile listening posts for the NSA, instead of gathering specifically naval intelligence. One, the Liberty was accidentally attacked by Israeli forces during the 1967 Six-Day War,1 while another, Pueblo, was captured by the North Koreans the following year. This appears to have dampened US interest in vessels of this type, although warships often have the equipment to carry out similar missions. Not every vessel that bristles with strange antennas is an AGI. During the 1950s, both the US and the USSR discovered that missile tests and satellites often needed ground stations to receive telemetry in locations where building them on land was difficult or impossible. The result was the tracking ship, which often doubled as a secondary mission control in the era before it was easy to dial up a satellite and relay everything back to the main control center. Eventually, improved satellites and a reduced pace of missile testing consigned most of the tracking ships to the scrapyard, but a few remain in service. These are usually also equipped to monitor the missile tests of potential enemies, tracking them with incredibly precise radar and recording their telemetry for analysis. The Cold War drove many other types of specialized auxiliary. To extend radar coverage away from land, the US converted many former cargo ships to radar pickets, which served for a decade before improved radar rendered them obsolete. 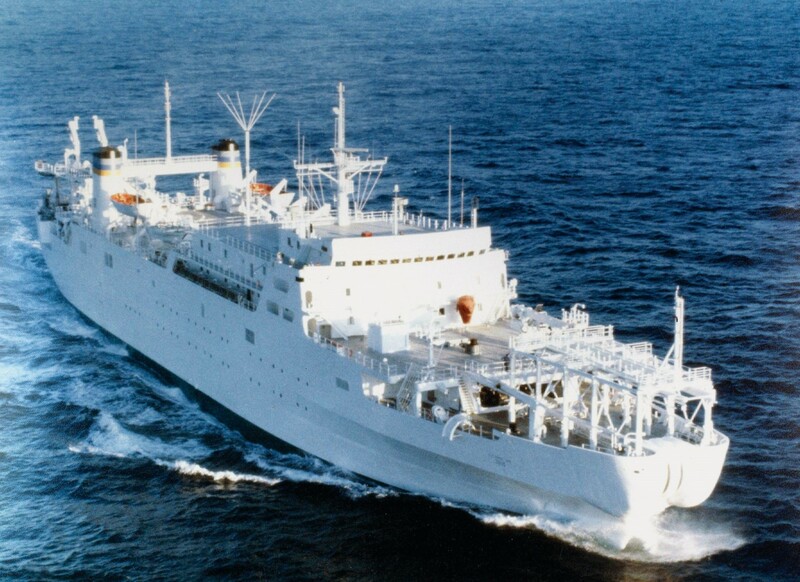 To provide the president with a floating command post, immune from nuclear attack, a few ships were converted into floating communications relays. To move cargo to bases in the Arctic, the specialized cargo ship Point Barrow was built with extra insulation and a hull strengthened to deal with ice. Later, she was renamed Point Loma and used to haul components of the Saturn V rocket from California to Florida, and in support of deep-submergence programs. 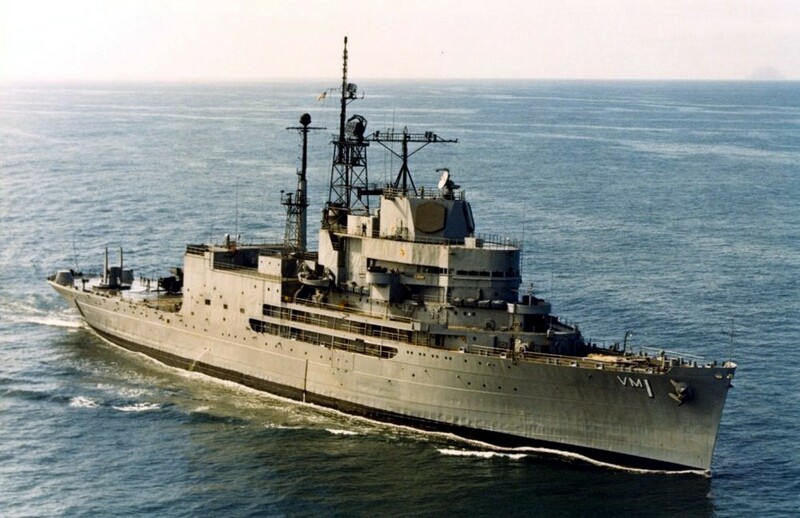 Point Loma was not the only vessel deployed to support undersea warfare during the Cold War. Submarines, previously confined to the waters near the surface, now needed to understand the deep ocean. New oceanographic and surveying ships were built, to study everything from the shape of the deep ocean floor to the long-range behavior of sound in the open sea. These required labs, cranes to handle sensor packages and remotely-operated (underwater) vehicles (ROVs). Eventually, this knowledge was used to create networks of seabed sensors, such as the US SOSUS system. Supporting these required specialized vessels with equipment to handle cables over the bow and stern. 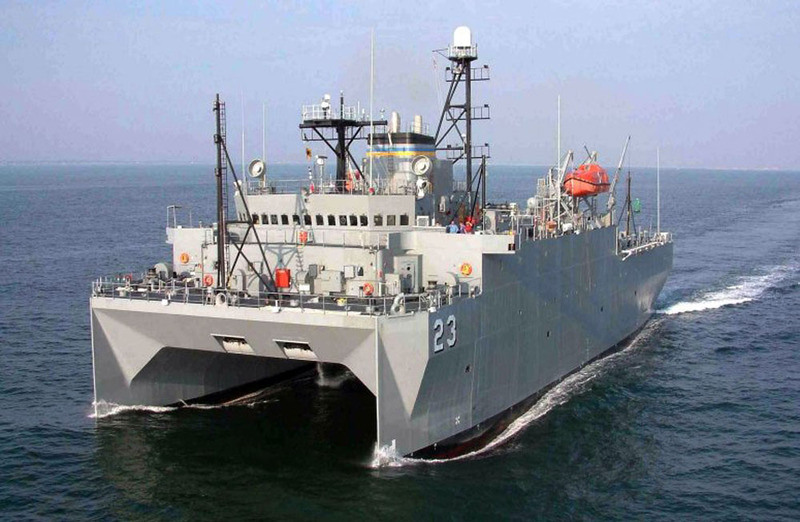 Even these vessels could not plant sensors in really deep water, and the USN developed a specialized towed array known as SURTASS which could fill in the gaps. The first tow ships for these arrays were modified tugs, but the need for operations in rough seas meant that later vessels used a Small-waterplane-area twin hull (SWATH) form. This involves a pair of submerged hulls connected to the deck above by narrow stalks, which minimizes the effects of waves on the ship. 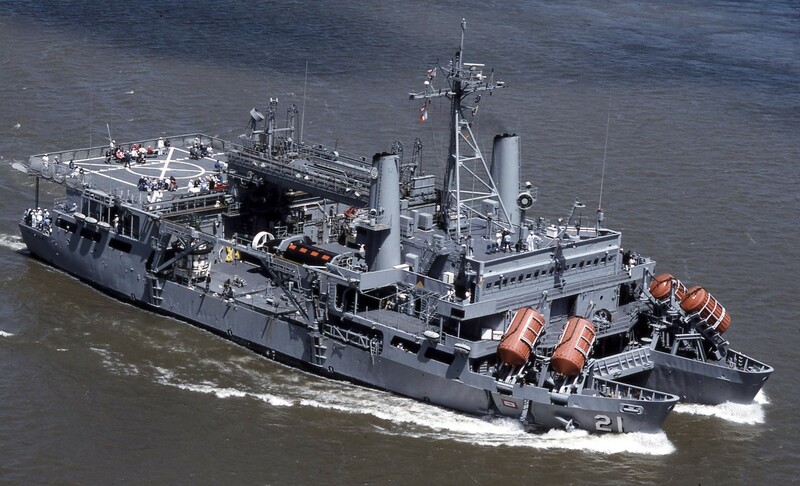 Twin hulls were also used for the USN's specialist submarine rescue ships of the Pigeon class. This gave them great stability and ample deck space for diving and rescue operations on a reasonable tonnage, as well as the ability to operate the DSRV in the space between their hulls.2 The Deep Submergence Rescue Vehicle was designed in the wake of the loss of the submarine Thresher to be able to dive to 5,000 ft, dock with any submarine in the world, and take off 24 stranded crewmen. 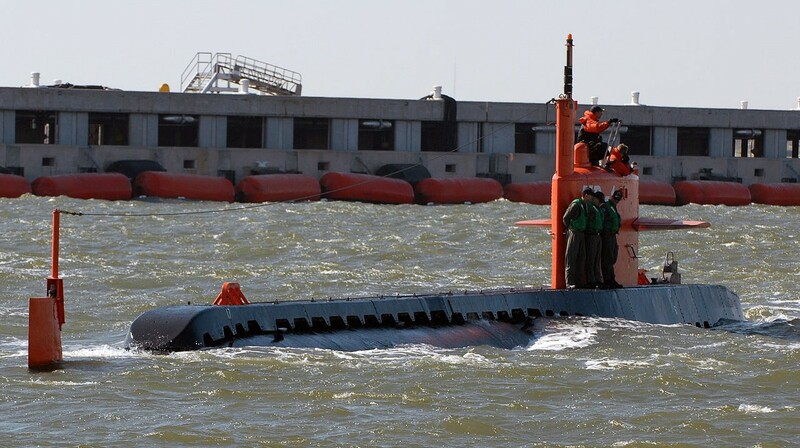 To get there, the DSRV could be carried by a submarine rescue ship or piggybacked on another submarine. If needed, it could be transported by a C-5 Galaxy anywhere in the world on short notice. A few other specialized submarines were built. Admiral Hymen G. Rickover, father of the nuclear navy, built a nuclear-powered minisubmarine, NR-1, essentially on his own. NR-1 was never commissioned, and was the only submarine ever permanently fitted with wheels, but it gave excellent service to both public oceanography and the secret war fought underneath the waves. The experimental USS Albacore prototyped modern submarine hulls, while the USS Dolphin tested many systems that were later fitted to operational submarines. Dolphin was only one of many trials ships that were built to smooth the transition of new equipment from lab to the fleet. In some cases an operational ship is converted briefly as a testbed, such as when Hull served as the testbed for the Major Caliber Lightweight Gun. In others, ships are permanently converted to support trials. Prominent examples include the former battleship Mississippi, which later fired the first shipboard examples of the Terrier SAM; Girdle Ness, which conducted initial trials for the British Sea Slug; Norton Sound, the first ship to take Aegis to sea; and the US Navy's Self Defense Test Ship, which is equipped with the next generation of point-defense systems. The current ship to fill that role, the former destroyer Paul F. Foster, has tested everything from laser weapons to biofuels. This isn't an exhaustive list of all of the auxiliary types to have seen service since the end of WWII by any means. Even leaving aside the types developed earlier, the variety of auxiliary ships is practically endless. Everything from training ships to heavy icebreakers to crane ships to torpedo retrievers has seen service in different navies. While the list above is somewhat US-centric, this is primarily because as the USN's support fleet is the largest and most diverse. Other navies make extensive use of auxiliaries, too. China in particular has had a very active program in recent years, although little information has reached the west on most types. But no matter how many or few, whether they carry oil, ammunition, or strange electronics, auxiliaries remain as vital to naval power today as at any point over the past century. On twin-hulled submarine rescue ships- I've posted about it here before, but the Russian Navy's Kommuna is still IMO worth a mention. It was laid down in 1912 in the Putilov Works in St. Petersburg, commissioned into the Imperial Russian Navy in 1915 (as Volkhov) and is still in service today in (close to) its original role. I completely forgot about that when I was writing. This is why I have the ability to go back and add footnotes. How feasible is rescue from a submarine? By which I mean, what states are there where a sub cannot surface, but does not immediately sink and implode, like Thresher and, one presumes, Scorpion? It depends heavily on the situation the submarine finds itself in. Thresher and Scorpion both went down with all hands and no chance of rescue, but there have been lots of situations in the past where submarines have gone down with survivors. Squalus and, more recently, Kursk spring to mind. The former saw everyone who didn't die immediately get rescued, while the later would have had survivors if not for the Russians refusing help from NATO. The edge of the continental shelf is uniformly about 460' deep, dropping within a few miles to many thousands of feet. While the test depths of modern submarines are mostly classified and the actual crush depths mostly theoretical, it is likely that any submarine which sinks on the continental shelf will have surviving crew in un-crushed compartments and any submarine which sinks into the abyssal depths will implode before reaching the bottom. If there's an external hatch in one of the undamaged compartments, and the submarine is approximately upright, the crew can be rescued by an appropriate submersible rescue vehicle. We've been doing this since 1939. You'll probably have at least a couple of days, so if you're one of the dozen or so navies with working DSRVs and are on your own continental shelf rather than someone else's, or you are willing to ask for help from NATO (which has air-transportable DSRVs), should be no problem. Unless the submarine sank on a secret mission and couldn't release a buoy with a distress beacon, in which case you probably won't find it in time. If there's no accessible external hatch, I don't think anyone has a way to cut through the pressure hull without killing the crew before you have a big enough opening to extract them. It might in some marginal cases be possible to refloat the the hull, as seen in "Das Boot" but more practical with outside assistance. If there's an external hatch that can be opened against pressure, e.g. a lockout chamber, then the crew can in principle rescue themselves. Buoyant free ascent, basically just swimming to the surface in your skivvies, has been demonstrated from a bit over 300' and is theoretically possible down to 600' if you don't panic when your eardrums rupture (hence only demonstrated to 300'). So, possible anywhere on the continental shelf. Of course, this leaves you floating in the ocean in your skivvies, so that's not much of an improvement. Some navies don't bother training for such a low-percentage move, others provide exposure suits that should keep an escaping submariner alive for a day or so after reaching the surface. Is this an article that'd benefit from mention of the Glomar Explorer? I know it's not originally a true Navy ship, but it feels like it would be fitting. I thought about that, but decided it didn't fit with the story I wanted to tell. Everything here except Point Barrow is a type, not a single ship, and the Azorian story is pretty well-known and very different from day-to-day auxiliary roles.